When Russia invaded Crimea and sent unmarked soldiers into Ukraine in February 2014, the European Union was swift in condemning the actions and utilized sanctions against Russia almost immediately. Sanctions will only be lifted if the Minsk II Agreement’s requirements are implemented – which does not even include anything regarding Crimea’s status. Sanctions are like a penalty; a country is punished for behavior that goes against international norms. The norm Russia broke was the norm of sovereignty, and that did not sit well with the European Union (especially countries who share borders with Russia). For the European Union, who lacks its own official military and thus lacks the ability to respond to hard power with hard power, economic sanctions are the tool of choice. However, if the goal of sanctions is to push Russia to either respect the norm of sovereignty and withdraw troops, or in general to coerce Russia to stop doing what it’s doing, can these sanctions be considered helpful? Sanctions have been added since 2014, and as we enter 2018, the effects of these sanctions should be examined. The Russian economy has tanked, with some calling Russia’s economic growth, “lethargic.” While economic problems were expected, something else has come up that was not one of the intended consequences – a tanking birth rate. Sure, if people feel the economic pinch in Russia they are less likely to want to have children if the quality of life they can provide decreases or if feeding another child simply becomes more expensive. However, a 15% decrease in the birth rate is concerning, especially if this trend continues. Dr. Mark Lawrence Schrad, an associate professor of political science at Villanova University said, “it is somewhat ironic that the long-term consequence of sanctions might be to push Russia over a demographic cliff,” instead of an economic cliff. If we look at the goal of EU sanctions, to encourage Russia to respect Ukraine’s sovereignty, these sanctions that have lasted almost a full four years are not successful. If the goal was to encourage the Russian people to view Putin as a war-instigator or an autocrat, these sanctions are absolute disaster for European perceptions. The Russian people do not blame Vladimir Putin for the sanctions, they blame Europe. Russia didn’t ask for sanctions, and European sanctions are created by European politicians – or so that logic goes. Vladimir Putin’s popularity has increased over this time period, indicating the spin he puts on these sanctions is working and working well. 60% of Russians have a negative view of the European Union (70% viewed the US negatively as well) and that poll was from 2015, and 70% of Russians believe they should continue its present politics in spite of sanctions. With the new data on Russian demographics coming out, one has to wonder how Putin will spin this and what those consequences are. If Putin, as I believe, spins the data to suggest the EU and US sanctions are attempts to wipe-out Russia (and Russian people), Ukraine could be the least of the EU’s problems. 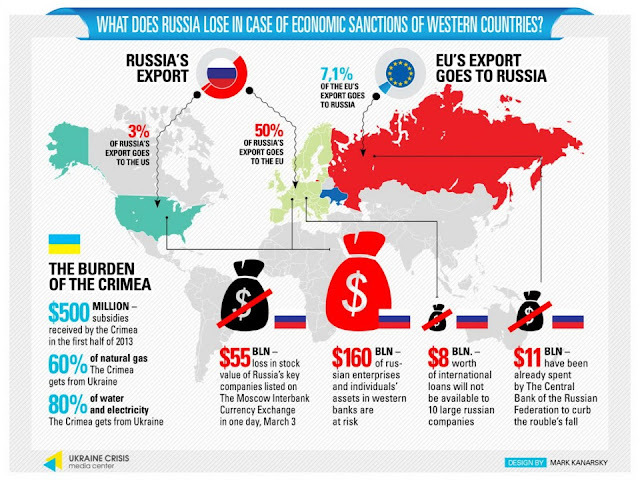 The European Union must keep in mind the way Russians are viewing these sanctions, especially as they seek to continue sanctions through 2018. The perception problem is a threat to EU security. Katherine Brown is a graduate student at the European Union Center and Chair of the Illinois Student Government Subcommittee on Graduate & Professional Student Affairs.